Vivo mobiles are one of the best seller in online market, and with offer of Debit Card EMI you can buy Vivo Mobiles on Debit card EMI from selected banks like HDFC and SBI. 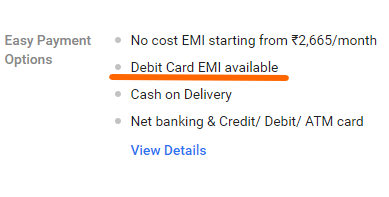 How to buy on Debit Card EMI? 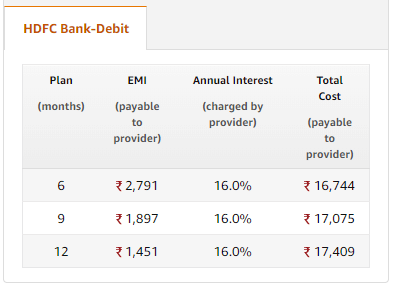 Interest for Debit Card is higher compared to Credit Card, below table is example of different option available for EMI. On the products details page you can view if option is available. On Products details page, Click on Options and you will able to view Details with monthly installments and EMI. As of now currently we have only HDFC Bank as Debit Card EMI options, below external links will help guide you step by step process.